Capt. 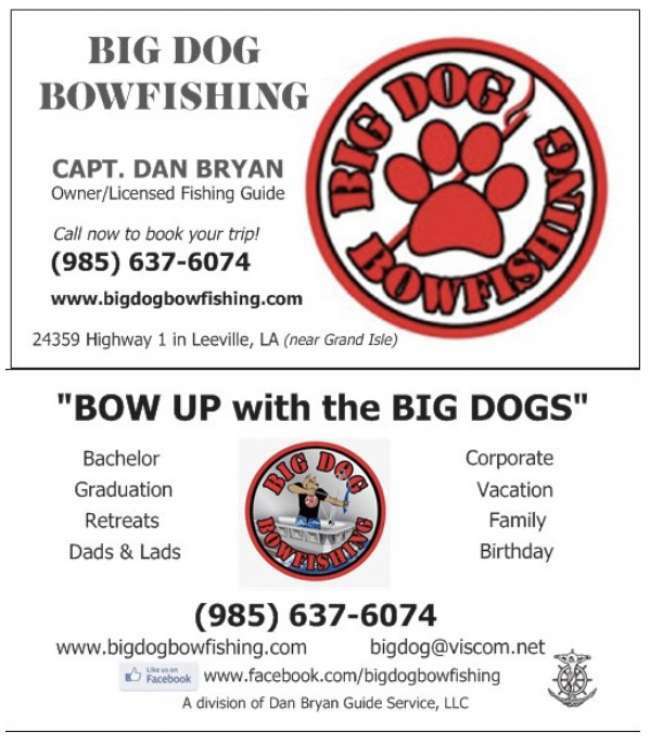 Dan Bryan is a seasoned Fishing Guide with 30 years of experience bowfishing and day fishing. He is a USCG Captain and licensed Fishing Guide with the LA Wildlife & Fisheries. He lives and docks out of Leeville, LA near Grand Isle. Capt. Dan has a 21' Airboat with LED Lights and all the bowfishing equipment needed for you trip including fish cleaning. Each Boat holds 4-6 bowfishing shooters. Cost is $200 per person (4 person minimum) all equipment and fish cleaning included. We also have on-site bunkhouse lodging available at $35 per person per night. Group trips available with advance notice.